John Juanda started as the short stack and was the first one to be eliminated, during Level 17 (20,000/40,000 - 5,000 ante) he shoved for 470,000 with J9 suited but he couldn't improve against Thomas Muehloecker's AK. Luuk Gieles, who started the finale as the chip leader was the next one to go, he lost a big pot with the second nut flush against the nut flush and lost his remaining 4 big blinds shortly after. Daniel Dvoress finished in 6th after running his AT into Sam Greenwood's AA and soon he was followed by Thomas Muehloecker. 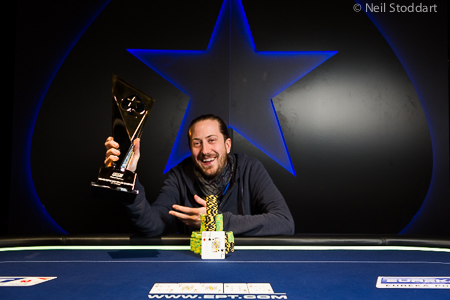 On Level 21 (50,000/100,000 - 10,000 ante) EPT Malta High Roller champ Urbanovich shoved for 1,425 million from UTG with KQ suited, he was called by Steve O'Dwyer in the big blind with A7 and he couldnt improve on the 9-7-5-3-J board. During the same blind level, Steve O'Dwyer raised to 260,000 from the small blind, Kurganov raised all-in for 2.18 milion from the big blind and O'Dwyer called after getting a count of Kurganov's stack. O'Dwyer had KJ but Kurganov showed a dominating AJ. Unfortunately for him, the board ran out K-T-3-J-3 and he was eliminated in third for €376,400. The tournament ended during Level 22 (60,000/120,000 - 20,000 ante). Greenwood opened to 300,000 on the button and O'Dwyer 3bet to 900,000. Greenwood called then both players checked the Q-J-4 flop. O'Dwyer check/called 830,000 after a 6 hit the turn and checked once again after the river 5. Greenwood shoved all-in for 3,165 million and O'Dwyer called. Greenwood showed T-9 for a busted straight draw and O'Dwyer showed J-T for second pair. O'Dwyer received €746,543 for the win and is now very close to Byron Kaverman and Anthony Zinno on the GPI Player of the Year race.